In this article I’ll try to describe the configuration management of modern Mozilla Firefox versions via Group Policies in a corporate environment (Microsoft Active Directory-based domain environment). Earlier, it wasn’t too hard to manage Firefox settings in the corporate environment, since as any normal Windows application, all Firefox settings were stored in the registry. You could find or write the necessary GPO administrative templates to make it easier for administrators. (For example, Google has developed and is supporting a set of adm/admx templates for Chrome.) However, Mozilla decided to make it different, and now Firefox stores its settings in the files located in the user profile. After digging in the Internet for a long time, I’ve found some “solutions” of this problem. But none of them is operational on different reasons. The common idea of these solutions is to create a GPO, make changes to the specific registry branch and then specify the necessary parameters in Firefox configuration files using a Visual Basic script. At the first glance, it is convenient and consistent, but … there is always a slight hitch. Mozilla developers change both the location of the configuration files and the names of these files, etc. The method described in this article has been tested in modern Firefox versions (Firefox 43.0.2 and higher). 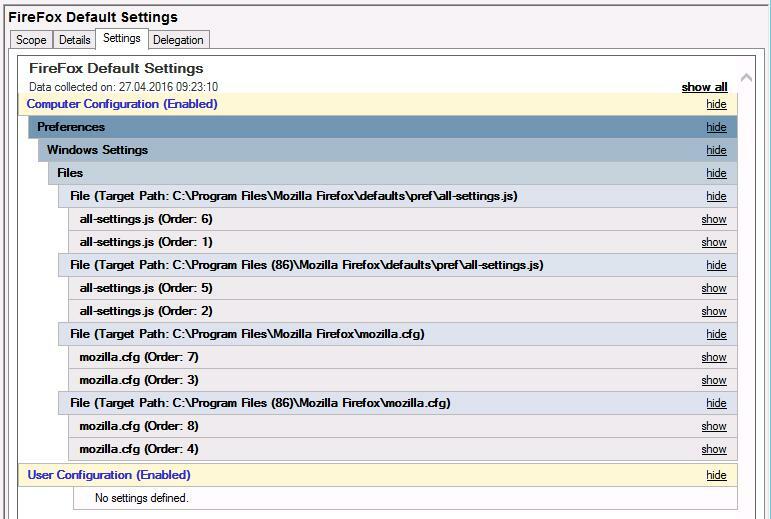 There is a number of Firefox settings to be used both for preconfiguration and to disable or block something in a enterprise environment, where the users, as a rule, do not have the administrator privileges, and IT specialists have to determine, which browser settings are allowed to change and which settings are left preset and unchangeable in this environment. 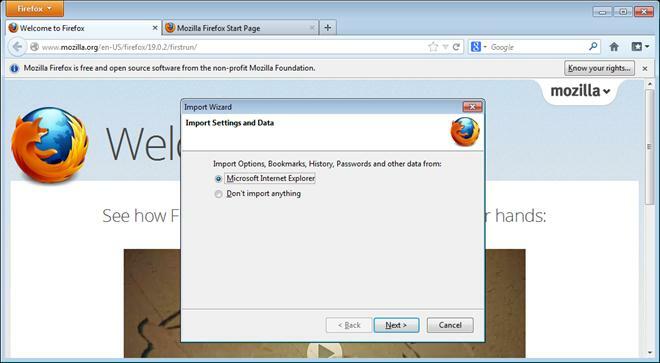 Import Wizard – Firefox runs this wizard at the first start to import the settings from other installed browsers. You would like to disable this wizard. Automatic updates for Firefox – Options -> Advanced -> Update -> Firefox updates. Firefox is better to update centrally, but not separately for every user computer. Automatic updates for the extensions can be left, since they are stored in the user computer. Mozilla Maintenance Service – Firefox installs the update service, which allows to automatically update Firefox without prompting UAC permissions. Default browser check – Options -> Advanced -> General – Always check to see if Firefox is the default browser on startup. If Microsoft Internet Explorer is selected as a default browser in the corporate environment, this check has to be disabled and the opportunity to make Firefox a default browser by a user has to be blocked. At the first start, disable ‘Welcome to Firefox’ tab, as well as ‘Know your rights’ and ‘Improve Firefox’ notifications. Then Firefox will be configured with the default settings and all necessary parameters will be locked. See http://kb.mozillazine.org/Locking_preferences for more details. Please note that the article is a bit obsolete, but the main principles are still working. To configure user settings, you have to use the feature of locking user preferences. Here we can determine and lock the specific Firefox settings. For instance, in the example below, the automatic update feature, “Welcome to Firefox” tab and “Know your rights” and “Improve Firefox” notifications are blocked. The last line prevents making Firefox a default browser. All parameters in Mozilla.cfg has to be written starting from the second line. Don’t ask me why. For example, try to put a comment // in the first line. The parameters and all settings are case-sensitive. If you make a mistake, Firefox won’t start. A sample of Mozilla.cfg used in the real corporate environment is shown below. Note. Pay attention to the fact that all parameters are determined with the help of pref. It means that the parameter will be set, but a user will be able to change it. To make the parameter unchangeable, use lockPref. // particular preference this way, it shows up in about:config as “user set”. // Appears in about:config as “default”. Then you have to copy these files to the computers of your users. 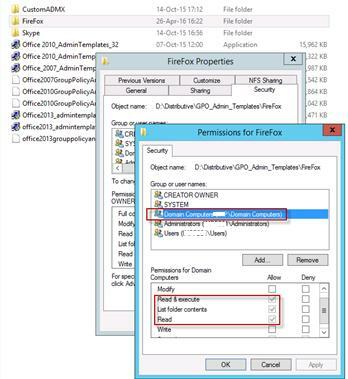 To do it, create the rules of deleting/copying files using Group Policy preferences (GPP). Note. The disadvantage of this method is the fact that if you have an x86 workstation, the folder C:\Program File (86) with the subfolder Mozilla Firefox (containing defaults\perf) will be additionally created. Of course, you can load your policy with the filters to detect the bitness of the installed OS, but … I’m too lazy. I’ll give it to you as the home task :-). I have these files located in Firefox folder in the network share. 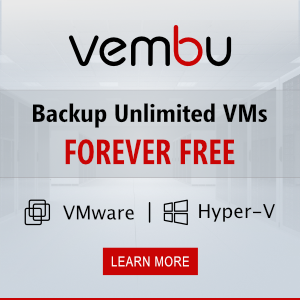 The enforced policy is used, which is applied every time when a computer connects to the network. Each time the files are deleted and then copied back again. Why? It is convenient for me. Nothing more. That is almost all. We have configured the file Mozilla.cfg and copied it to the user computers. Now you can create your own Mozilla.cfg, determine your settings, and lock those settings you wouldn’t like to be changed by the users.